Dr.Jugal Kishore an outstanding homoeopath, world renowned physician passed away on 23rd January 2012 The whole homoeopathic fraternity pays their respect and homage to this great soul of homoeopathy. He has the distinction of being appointed four times as the Hon. Physician to the President of India. He was the President of the Central Council of Homoeopathy. He also served as Homoeopathic Advisor to the Govt.of India. He was the founder Director of Nehru Homoeopathic Medical College. He served as President Asian Homoeopathic Medical League (AHML) and National Chief Executive International Homoeopathic Medical Organization. 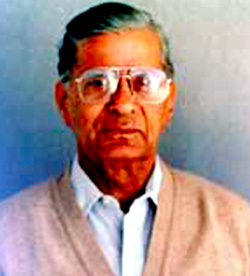 Dr.Jugal Kishore was practicing Homoeopathy for more than 56 years in Delhi. He was born in 1915, graduated from the Foreman Christian College. Lahore (Punjab University) getting the highest aggregate marks and winning merit scholarship both in school and college. He graduated in Homoeopathic medicine from the Faulty of Homoeopathic Medicine, West Bengal. He is the creator of the Kishore Cards- the best punch card system for Homoeopathic Reportorial analysis and is the author of ‘Evolution of Homoeopathic Repertories and Repertorisation’. He was the founder of Sardha Boiron LTD in collaboration with Boiron, the SBL, leading Indian manufacturer now. I deeply shocked with the demise of Dr.Jugal Kishore. Todays education system in homoeopathy is the dream realization of this great visionary. Dr.Jugal Kishore thrived for uniform education. I pay my tribute to Dr.Jugal Kishore. We lost a LEGEND in Homoeopathy namely Dr. Jugal Kishore, the first nominated Vice President and the first elected President of nominated Central Council of Homoeopathy. He was a very down to earth man. My condolences to the whole profession as well as to his family members. Dr. Jugal kishore the world renowned homoeopathic practitioner is no more with us. His demise created a vacuum in the Homoeopathic fraternity. May his sole rest in peace. Dr.Jugal Kishore, former Honorary Physician to President of India, Honorary Advisor Homoeopathy, former President of CCH and Chairman Scientific Advisory Committee CCRH is no more with us. His contribution to Homoeopathy and also to its practitioners will be remembered forever. He was an excellent practitioner and researcher in Homoeopathy besides author of several books. I pray his soul may rest in peace. Dr.Jugal Kishore was instrumental in establishing homoeopathy in India. His contribution in education, research and clinical practice, policy making and manufacturing of quality medicine is immense and incomparable. It is a great loss to homoeopathy. I pay my homage to him. Dr.Jugal Kishore has paved path for academic homoeopathy in India and laid foundation for uniform education which has become bacon light for rest of world .With his demise a great loss will be felt by all. I salute to the great soul. The Indian Homoeopathy community has lost a great person. He was a professor scholar and first President of CCH many things developed in the government of India. I pay my homage to this great soul. Sorry to learn about the sad demise of reverent Dr.Jugal Kishore, Former President of Asian Homoeopathic Medical League & Central Council of Homoeopathy and a great Homoeopath of India. We have lost another stalwart within a short period. May his soul rest in eternal peace. It’s very sad to hear about the sudden demise of a great Homoeopath, Dr. Jugal Kishore. As a fresh Under Graduate I was very fascinated and interested in his great invention, The Kishore's Card Index Repertory, I was using it till the Computer Era came in, it was a great contribution to Homoeopathy. In fact Dr. Jugal Kishore was a very close family friend of my mother Dr. Chanchala and father Dr. Radhakrishnan, he used to visit our house whenever he was in Bangalore. May God give his family the courage to withstand this great loss. …with deep sense of sorrow, I express my condolence. We lost a good orator and a ethical prescriber. Our deepest condolences to his son Dr Arvind Kishore and all other family members. … he has been a gifted physician, attending large number of patients all over India. He was Honourary . Homoeopathic Physician to President of India, and many parliamentarians . He has also put his efforts to establish homoeopathy in Asian countries. I extend our heartfelt sympathies especially to Dr. Arvind Kishore, and his Sister, and their family members.